4.4 out of 5 based on 178 bloggers and 37 commenters. 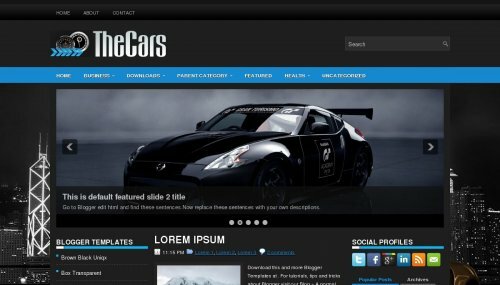 TheCars is a free blogger template adapted from WordPress with 3 columns, left and right sidebars, footer columns, social bookmarking icons, posts thumbnails, tabs, drop down menu and well designed threaded comments. your theme is just like mine, for this thanks..
how to instll the templete plese tell me. i like this template. thank you. hai… i have problem i canot save my work. I love this theme! Would anyone tell me how to remove the blue menu bar at the top of the page? anyone can help me how to change the default featured slide? anyone please tell me how to change the default slideshow. thx for that i like u r this one template, no one theam is batter to this one template. Cool Menu Secondary. Thank’s BT.!!! Buenas, como puedo modificar sobre el titulo y la barra de opciones?? You have to know HTML so you can edit each of the templates you download from this site. Otherwise it’s just to say ‘wow it’s cool’ but you can’t modify nothing. Can you please tell me how can I change the slide photos?